The Sales Education Foundation ranks Selling and Sales Management among the Top Sales Programs in the United States. Take business one step further by studying the human sciences of management through multiple hands-on learning opportunities including field experiences, sales competitions, sales-based student organizations, and attending the Retail and Financial Services Career Fair and the Student/Employer Reception. Professional selling is one of the fastest growing segments in business, creating a strong demand for technically sophisticated professional sales experts. Gain real-world experiences through a required internship or clinical experience, shadow a salesperson for a day, and engage in sales competitions with industry partners in the Center for Professional Selling. The Department of Consumer Science also hosts a career fair each year, drawing more than 60 employers to campus. Julie Eddleman describes herself as an "extremely curious person by nature." That trait has served her well in the 19 years she's delved into the minds of consumers at Cincinnati-based Procter & Gamble. Now, that natural curiosity is taking her in an entirely new direction. In September, Eddleman joined Google's new global brand team. In this role, she will serve as the global lead for Procter & Gamble, to help them utilize Google for strategic consumer messaging across all their brands and businesses. The new brand team was created to help companies grow their business with digital media and advise on all aspects of online business strategy. 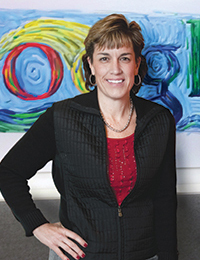 "The culture at Google is one of extreme innovation and rapid growth," Eddleman says. "That's very exciting to me. They're a young company, they've only been around for 15 years — they're younger than my career at P&G." Eddleman cut her marketing teeth at P&G — starting as an assistant brand manager on Hawaiian Punch right after earning a master's degree in consumer behavior at Purdue in 1995. An Indianapolis native, she had also attended Purdue for her undergraduate degree, earning a B.S. in Consumer Sciences and Retailing (now Consumer Science) in 1992. She continually advanced at P&G, and over the years, guided P&G's strategy for reaching an ever-changing audience in an increasingly digital world. Two years ago, she led the creation and implementation of P&G Brand Operations. As marketing director for North American Brand Operations, she worked with approximately 100 P&G brands, and she was responsible for a budget of over $3 billion. "My job was to understand how P&G consumers use media and how they want to get information, whether that's through a smartphone, tablet or more traditional routes," she says. "One of the biggest challenges we face is understanding media consumption and technology, and how quickly consumers will go to digital and mobile media." Leaving P&G wasn't an easy decision, Eddleman says. "They are an amazing company, and I will always be extremely grateful for the opportunity to work there. P&G is family. It was a huge benefit knowing that in my new role at Google, I can continue to work with people I enjoy and respect at P&G." Another perk is that she doesn't have to move from her home in Loveland, Ohio, located 45 minutes from Cincinnati. Eddleman describes Loveland, known as the "Sweetheart of Ohio," as being very much like the fictional Mayberry. She lives there with her partner, Diane, also a P&G employee, and their blended family. When asked what valuable lessons she learned at Purdue that have served her well over the years, her answer is particularly relevant for this stage of her life. "Many Purdue mentors taught me that change is the only constant," she says. "That's been very true. What I told the Purdue students when I participated in Old Masters (Eddleman was in the 2013 class of honorees) was to be involved in student activities and leading organizations. It teaches you to think on your feet, to learn and learn quickly." Also: Completion of a business-related course with a grade of C or higher.